Smart Home Ideas: Does it Boost the Value of your Home? What is Smart Technology? 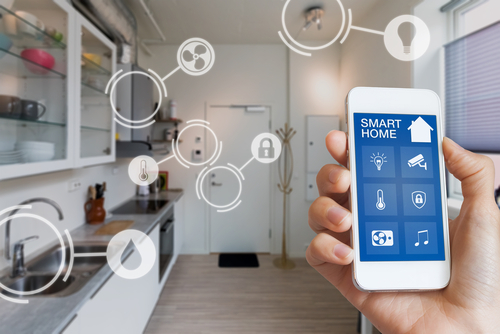 Over recent years we have seen the rapid rise of smart home technology in the UK – no longer being just a thing for tech geeks or the super rich, we have seen the integration of smart technology worm it’s way into the home; mostly with the intention of heightening security. When we think of ‘home’ we think ‘safe place’ and since smart home gadgets have become a lot more accessible and affordable, it seems as though almost everyone has jumped onto the bandwagon. So, would the instillation of smart technology make your home more attractive to potential buyers if you decided to sell? Probably the most popular installation on our list, who doesn’t have one of these ? A video doorbell assists you in keeping unwanted callers at bay and lets you keep an eye on your front door from wherever you happen to be. There are many brands to choose from, but the main purpose is that it sends you real time notifications via an app to your smart phone or tablet whenever there is motion at your front door. It also features a speaker and a microphone, which allows two-way audio so you can speak to the person at the door no matter where you are as long as you’re connected to Wi-Fi. It literally is as simple as that – who said smart house technology had to be complicated? So, does this boost home sales? Of course it does! It goes without saying that potential buyers, especially those with children, must ensure that a potential home is as safe as possible for them and their family. It’s reported that door step crime rates have been slashed since the rise of this smart home hub; helping over 100,000 UK home owners. With the fears of burglary being almost totally eradicated and having the ability to check up on the whereabouts of a family member wherever you may be, what more could you possibly ask for? Have you ever had that sudden urge of panic overcome you when you can’t remember whether you locked the back door or not? Installing a smart lock will prevent future panic attacks. Similar to the Doorbell Security Camera, as long as you’re connected to Wi-Fi or Bluetooth, you can lock and unlock your doors wherever you may be. Some smart home gadgets even include a Bluetooth feature that automatically unlocks your door once in range of Bluetooth. It’s reported that "the next generation of home owners will lead the way in adopting new technology - making features like the ability to preheat an oven or unlock the front door from your smartphone the new norm in home convenience." So, with millennials nearing the age of investing in their own properties; smart technology acts as an integral factor to how inclined they would be to buy a home with smart technology products. Therefore, investing in smart technology is bound to boost sales. Have you ever been comfy in bed, ready to doze off but then you realise… You’ve left the lights on. The ultimate inconvenience. Smart lighting, including smart dimmers and sensors give you the ability to switch your lights on and off wherever you may be via your smart phone or tablet. Smart outdoor technology also heightens the security of your home. It acts as a motion detector and aids you in being able to go outside at night by lighting up your back garden. So, will installing this smart home automation enhance your home to potential buyers? It’s reported that “the cost of lighting your home amounts to about 12% of your home’s annual energy bill”. Although this may not seem like a lot, smart technology assists you with automated light usage and helps you regulate when your lights should be turned on and off. Many of us have returned to our houses and realised that we’ve left the lights on for most of the day which is a huge waste of energy and money. This is one of the many benefits of smart home technology. Baring this in mind, why would this not convert potential buyers in purchasing a smart home? Lesser costs and conservation of energy, what more could you ask for? • Smart Homes are safer – The smart home tech ideas not only deter burglars, but if a crime does unfortunately take place, you will have footage to forward on to the police. Aside from this, smart devices can detect several threats including fire, moisture levels, carbon monoxide and so much more. Also, smart locks eliminate the risk of anyone being able to enter your home uninvited. • Smart homes will save energy – as mentioned earlier, being able to control your electrics at the press of a button is bound to save you money. It’s reported that smart thermostats have saved customers up to 15%. other smart home ideas to save energy include smart dishwashers and washing machines, which up front are of course more expensive but will save you money in the long run by conserving heat and water. • Smart homes will save you stress – Being able to do most of those annoying jobs, like switching the lights off or getting your keys out of your bag to unlock the door from a single touch on your smart device sounds like a dream! • Smart home installation is easy! – this one is self-explanatory, but it’s not as hard as you would think! Most installations are straightforward so if that has been deterring you from investing fear not! • Smart Homes are easier to sell – its reported that ‘57% of Millennials believe that smart technology is a good investment within the home’ so with millennials being the next front runners for purchasing – you may as well get investing now! As mentioned earlier, although some smart technology is on the pricier side you will reap the benefits later. A survey by CBS stated that almost two thirds of first-time buyers would be more prone to purchasing a property with smart home technology than one without. Would you feel more inclined to purchasing a property that has smart technology? If you enjoyed this article you could take a look at another one of our articles on the percentage of home buyers moving into new build homes.